There have been so many different takes on Batman over the years, both in the comics and out of them, that sometimes it feels like everything that has been said about him as a character has been said. 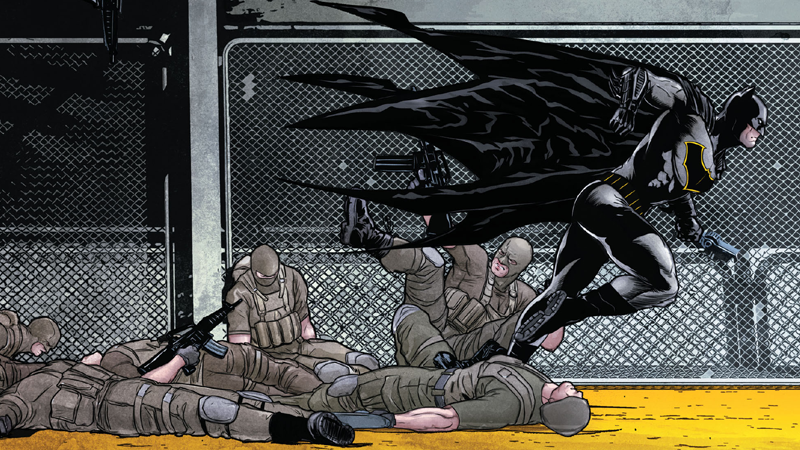 But today’s Batman #12 reveals a new layer to what drives Bruce Wayne that marks a significant addition to our understanding of the character. Virtually all of the story in Tom King’s script in this issue is told through a letter from Bruce to Selina Kyle before her transferal from Blackgate prison to Arkham Asylum, an event first revealed at the opening of this current “I am Suicide” storyline. Doled out over scenes of a silent Batman diligently clearing his way through Bane’s compound—incredibly, gorgeously rendered by the fantastic artwork of Mikel Janín, Hugo Petrus, and June Chung—for a rematch with the villain, the letter is a contemplative examination of why Bruce and Selina do the things they do, namely running around in costumes and dealing with their problems by punching them . Bruce writes that his parents, if they were alive, would find his life ridiculous and absurd, as would most of the world. But he knows—and he knows that Selina understands, more importantly—that he can never see the life he leads as silly because of an event that he reveals to Selina (and readers)for the first time: the fact that it wasn’t his parent’s death that drove him to become Batman. It was a suicide attempt at the age of 10. His recollection of the moment—cutting into his wrist with one of his own father’s razors as he tearfully apologized to his parents and prayed—is haunting, and devastating in its starkness. Delivered over another vivid spread from Janín, Petrus, and Chung of Batman clearing a path through a sea of Bane’s henchmen, the contrast between the machismo of the action and emotional vulnerability of someone who attempted suicide is palpable. You might expect it to segue into a story of hope, about how a little boy at the darkest period of his life chose to set himself on a path to upholding justice, but tragically Bruce doesn’t see his decision to live like that. He describes the moment after his suicide attempt, the pledge he made to fight crime, as “the choice of a boy, the choice to die.” He doesn’t see it as an act of survival—it was the metaphorical death of Bruce Wayne, which allowed him to be reborn as the person who would become the Dark Knight. He invokes the title of the story arc, which many, including us, had assumed to be a reference to Bruce building his own “Suicide Squad” for the mission. It’s a brutal summation of what Bruce thinks he’s become. It both fits a man who has dedicated himself to a thankless cause—at times to an absurd degree—and yet it sets him even further apart from all the other heroes he’s worked with. Batman can see other heroes like Jason Todd or Tim Drake as people beyond their masks, so when he lost them he mourned them. But he doesn’t see himself in the same way—even all these years later, as an adult, he can’t see himself as person at all. He can value others, but not himself. It’s heartbreaking. The idea of Batman being the “real” self of Bruce Wayne, and the uncostumed side becoming the mask, is not exactly a new take. But this “twist”—which feels like the wrong word to use, like it almost cheapens it—is quite unlike any interpretation of Batman in recent memory. It gives us a fundamentally different, altogether more devastating, understanding of who this take on Batman is.